In this tutorial you will build a wailing siren that plays a tone that increases and decreases in pitch. The circuit is built from two 555 timer ICs and some additional electronic components. The wailing tone is played on a loudspeaker. This is the first tutorial in this series that does not include step by step photos of the circuit being built. 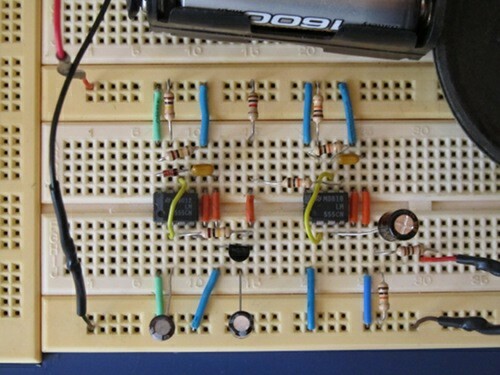 It is important to start learning to build circuits from the circuit diagram only. Complete Tutorial 5: 555 LED Flasher before attempting this tutorial. Read about diodes. Click the circuit diagram for a bigger image. The circuit is really just two 555 timer circuits joined together. Start by building the left part of the circuit around U1 (the left 555 timer). 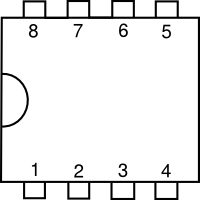 A photo of the complete circuit is shown below. Click the photo below for a larger image of the completed circuit. When building the circuit from the schematic diagram only, always carefully check the circuit after building it. The best way to check it is to take one IC at a time and check from pin 1 through to pin 8. Check that each item and connection shown in the schematic is present on your breadboard circuit. E.g. 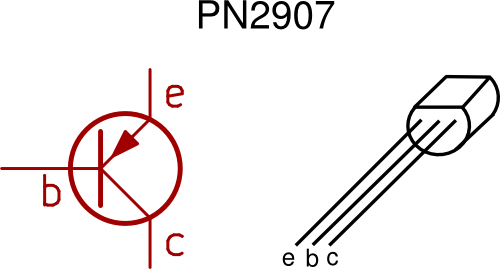 in the wailing siren circuit, start with IC U1 and check that it is connected to the GND rail of the breadboard. Now check that pin 2 is connected to pin 6 of the IC and that capacitor C2 is connected from pin 2 and 6 to GND. Also check that C2 is connected with the negative lead to GND. Check pin 3 of U1 next – see that it connects through R6 and C3 to GND. Carry on checking the rest of the pins of U1 and then move on to U2. After connecting the battery, the circuit will produce the wailing sound. 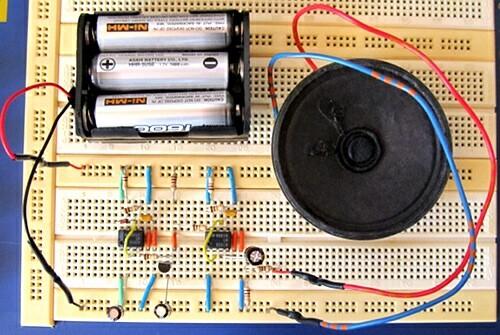 For a different sound, remove capacitor C3 from the circuit as shown in the video.